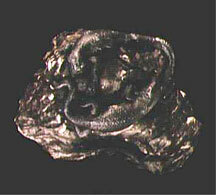 Inspired by geological forms I began the Reptile Rock Boxes series in 1994. The 'rock's' exterior texture resembles rock types - Igneous/Metamorphic, Sedimentary/Conglomerate (Sandstone) or smooth River Stones. The river stones in groups nestle together as if you found them in a stream bed. Other boxes are multi-chambered, looking like stacks of sandstone. or impressions of fossils (trilobites, my favorite). These boxes are great containers for small treasures. They open to reveal a geode-like interior of colorful blue and green melted glass and glazes representing a hidden life sustaining pool of water, a most important treasure in the desert. I’ve made over 1,200 of these boxes and still delight in their form and surprise interiors. This rock box series is my strongest environmental statement. The subject "water in the desert", the recycled clay, reclaimed glazes and glass removed from the desert and city streets emphasizes my strong commitment to recycling, and protecting the desert's natural water. See glaze reclamation essay. Prices range from $45 to $300. These tall-footed platters and footed bowls use lizard and fossil impressions, especially trilobites on the pedestal or tripod section. Prices range from $40 to $490. The Reptile Rock Boxes are a signed numbered series I started exploring in the late 70's and began producing with Lizard imagery in 1994. The rock boxes are available in basalt (Igneous), sandstone (Sedimentary) and conglomerate (Sedimentary). The small (I can almost close my hand around them) basalt and conglomerate styles with a single lizard retails in the $45.-$55. range. 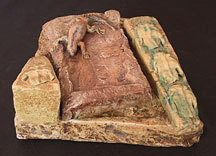 Larger boxes, (Up to 9 inches in width or height) with several lizards retail from $60.-$120. The sandstone style retail at $50 for a small simple one, up to $360 for larger multi-chamber boxes (up to 14 inches in width). The sandstone style are also available featuring fossil impressions as a design element on the lid and outside. Fall of 2003 I began producing boxes with Snakes and Gila Monsters. 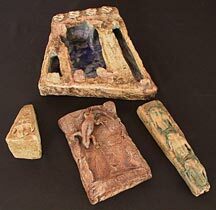 In the late 90's I produced a few sets of river-stone style boxes that are separate units but made to display as a set and rearranged at your pleasure. 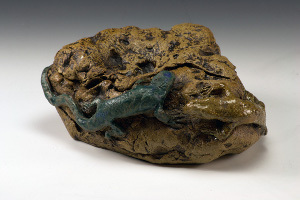 Inspired by geological forms, adorned with one or more lizards, horn toads, snakes or Gila Monsters and occasionally impressions of fossils and cactus skeletons, these boxes open to reveal a geode-like surprise of colorful blue and green melted glass and glaze that creates a wet looking interior, representing a hidden, life sustaining pool of water. Water, a treasure in the desert. All trilobite images are impressions in clay of actual fossils. No reptiles were harmed in making these works. Well, we won’t talk about what my cat did to the horned toad. 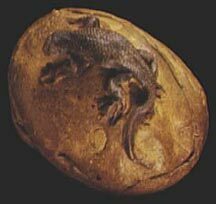 I began exploring fossil and lizard imagery in the 70's. Tucson's Gem and Mineral show inspired me to make press molds of various fossils that I incorporated into tiles, vessels, and boxes. 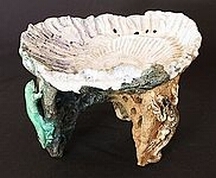 Three Footed forms evolved from a presentation form for platters into its own art form. These tall-footed platters and footed bowls use lizard and fossil impressions, especially trilobites, on the pedestal or tripod section. The hand-built footed section evolved into two styles; one monolithic shape that provides a backdrop for the lizards, the other a stalagmite style of arches with a lizard clinging to the edges. The platters incorporate impressions of fossils and lizards cavorting about, sometimes seeming to interact or evolve into each other, or from a life form to a fossil. 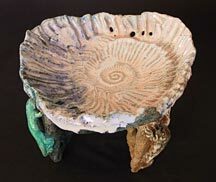 The fossil images are impressions of authentic fossils in stoneware clay. The sizes range from 4 inches high and 5 inches across to 16 inches high and 14 inches across. Prices range from $40.-$490.